Reading and Spelling Pure & Simple by Deede Hinckley Cauley Published by Real Reading Company 280 pages, wire bound (432) 213-0383 www.realreading.com E-mail: reading@suddenlink.net by Emerson Sandow Reading is the most important academic skill we can possess, tied with Critical Thinking. Today, many children have problems processing letters, sounds and words and special teaching is required. There must also be special books written to address problems with reading. Such a book is Reading and Spelling Pure & Simple: Phonics-Based Lessons for Teen, Elementary and Adult Students by Deede Hinckley Cauley. Ms. Cauley wrote RSPS to be used in teaching children with dyslexia and/or who have trouble with reading and she has repeatedly had children who use her book go from being non-readers to being accomplished readers in 90 lessons. No special teaching training is required; anyone who can read, can teach reading to another, using this book. In 1999, Deede began working with children, after 20 years of working with teens and adults. She specially wrote lessons to help the younger students succeed and that is RSPS today. She states that there was nothing like it then and there still isn’t. The student learns the 48 sounds of the letters and the spelling of them and once s/he has solidly mastered the contents of the book, s/he can read virtually anything. There are no pictures and no storyline in RSPS, so the student cannot guess the words, but actually has to read them. All 90 lessons are written in the same format, keeping teacher preparation and planning to a minimum. Lessons 1-23 of RSPS contain all sorts of focused teaching tips for professional teachers and parents alike. Each of the 90 lessons come with one page of easy-to-understand instructions for the teacher. Lesson 67 introduces diacritical marks to the student. These are the marks that show pronunciation, accent a syllable or separate a word. One example of a diacritical mark is the horizontal line above a vowel, meaning it has the long sound. This mark is called a macron. In this lesson, Deede suggests using a dictionary that features diacritical marks so the student and teacher can be sure of word pronunciation. After the 90 lessons, there are many pages of reference or supplemental material, such as an Index of Letters and Sounds to make reviewing easier and a set of Completion Charts to mark the student’s progress. 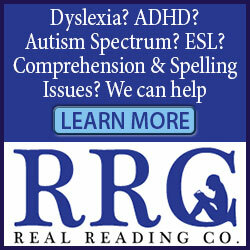 If your child is having trouble with reading, no matter what the cause, please visit the website, www.realreading.com to see videos of a child using RSPS and a teacher discussing its value. There is a section for Classroom Use and another for Homeschool Use, so you will gain plenty of information to see how Deede’s excellent book can help you solve the problems. E.S.